Current Protocols in Cell Biology provides methods for basic culture and fractionation of cells; microscopic localization and tracking; and analysis of biosynthesis, modification, and transport of specific molecules. In addition, the one-volume looseleaf manual offers more complex procedures involved in the determination of the role of intracellular and extracellular environment; molecular reconstitution of specific processes; molecular and temporal analysis of the cell cycle; investigation of intracellular and intercellular communications; and analysis of intact cells, organelles, and specific molecules. These topics are thoroughly explained with detailed protocols, critical parameters and troubleshooting guidelines. Extensive background information and authors' commentaries provide all the necessary information and guidance to facilitate successful results. Quarterly updates, filed into the looseleaf binder, keep you and your laboratory current with the latest developments in cell biology methodology. The initial purchase includes one year of updates and then subscribers may renew their annual subscriptions. 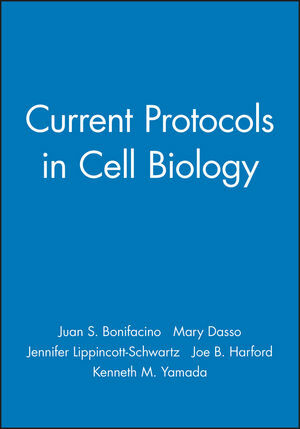 Current Protocols publishes a family of laboratory manuals for bioscientists, including Molecular Biology, Immunology, Human Genetics, Protein Science, Cytometry, Neuroscience, Pharmacology, and Toxicology. Preparation and Isolation of Cells. Subcellular Fractionation and Isolation of Organelles.